Come back soon Charlotte. I’m worn out! Dear readers, I’m extremely sorry that my blog is very late this week but I was admitted into hospital on Saturday because I was very ill. I was discharged yesterday but I’m still not feeling brilliant. The good news is that they found my brain, and due to a mixture of a rare brain condition and migraines I was totally unable to function. Hopefully all will be well now. The good news is that this weeks demo still went ahead, with Roy, Gordon and Jints at the helm. Roy took notes throughout, and was very patient when I kept asking if everything was going ok. Roy then emailed the notes to me and these notes will form the basis of this weeks blog. So please excuse the change of style etc, it is what it is and I’m extremely grateful to the gang for keeping the demo and advice session going in my absence. *Food parcels arrived with Gordon 10am. Two gone immediately. Sadly this isn’t unusual, we usually have a queue of people waiting for them. Universal Credit ensures that people are dependent upon them for survival. * Two women started verbally violent row screaming at each other across Old St. Language totally unfit for before 9pm watershed. *A woman arrived at the Jobcentre seeking an envelope. She had moved to the area 18mo ago. She then had been forced to claim Universal Credit and has had hard time repaying the Universal Credit advance loans she took out to keep afloat. *A woman joined in conversation and said she’s had “endless” trouble with UC. *A man arrived at the JC wearing just a t-shirt and thin pants. . He said he couldn’t afford a coat. This on chilly damp day, raining infact. This happens a lot when the weather changes. People don’t have enough money to buy clothes etc, so are forced to continue to wear unsuitable clothing because they have nothing else to wear. *Second message from Charlotte checking up on us. I make no apologies for this, I was missing being there and helping people but was too unwell to be there. *A young man arrived alone in a powered wheelchair struggling with doors which are very heavy to open even for an able bodied person. Many Jobcentres are just not disabled friendly in any shape or form, yet they deny people their ESA payments so they are then forced to have to use the unsuitable Jobcentres. 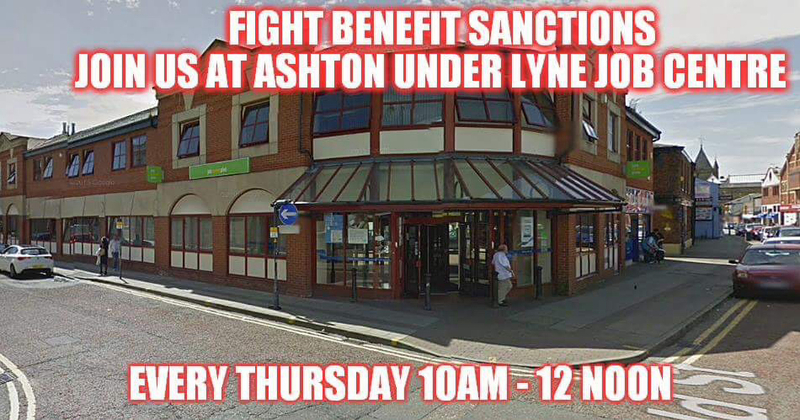 *Two older ladies arrived wanting to use phone in the Jobcentre to contact the DWP. Of course this wasn’t permitted. They took the public telephones out years ago, so now people have to struggle trying to find a telephone to use, and struggle to pay for the phone call. *We helped another woman trying to phone a relative to come and collect her. Her phone was flat so we lent her one of ours so she could telephone her relative. *A heckler described us as “bunch of nazis” and said we should wear National Socialist Party uniforms. We were too gobsmacked to respond. Sadly, people like this do like to shout abuse at us, even though the rubbish that they are spouting is complete rubbish and couldn’t be further than the truth. 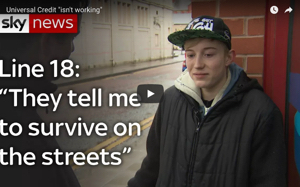 *A young man we see regularly said this was one of the days when Jobcentre staff were “not in the mood” meaning that he’d found them more unhelpful than usual. *Food parcels all went and everyone that we spoke to was either signposted, advised etc and all were given one of our leaflets. Like I’ve said before this all happened in less than to hours and we spoke to more people than is documented here. Please read, share, tweet, fb, email my blog. Many thanks to everyone that supports my blog, and to my collegues. I couldnt do this without you. Can’t cope with monthly Universal Credit payments… Tough. Haven’t recieved a payment for eight weeks. Universal credit strikes again. Good luck Charlotte, hope you recover quickly. “A heckler described us as “bunch of nazis” and said we should wear National Socialist Party uniforms.” could well be an agent provocateur employed by the DWP, something they have been known to do under the Tory government. Otherwise the heckler could be just a Tory, a Kipper or even a Tommy Robinson wannabe. Oh sorry to hear this Charlotte. Get well soon. A “bunch of Nazis” ? ?That makes about as much sense as calling Jeremy Corbyn an anti-Semite! A caring, sharing bunch of Nazis fighting against oppression and injustice, giving out helpful advice, food parcels and offering support. Maybe the heckler was Donald Trump in disguise.